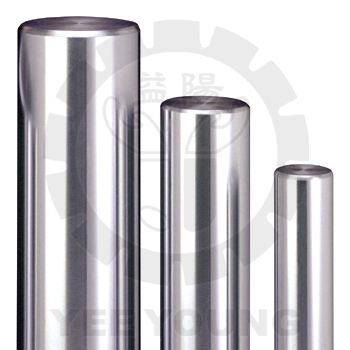 Material of medium-carbon Chromium Plated Piston Rod: JIS S45C / DIN CK45 / SAE 1045 and JIS S55C. By precision cold drawing, the tensile strength is higher. After harden chrome plating, the chrome shaft obtains good corrosion resistance, great abrasion resistance, uniformity of hardness. It can further go through other additional processing like lathing, milling, drilling, etc. Suitable for piston rod, hydraulic cylinder rod, pneumatic cylinder shaft, punching machine, pressing machine, mechanical guide rod, mechanical column bar, solid bar, crane, plastic injection machine, sealing machine, packaging machinery, and other automation machinery. * Other specifications can be ordered, please kindly contact with us!